Question: What is the dimension of the built in mouse pad on Adesso PCK-308PB PS/2 Tru-Form Pro-Contoured Ergonomic Keyboard with TouchPad Black? Answer: The touchpad dimensions are 2.4" x 1.8" (61 x 46 mm). Question: Is this product Apple compatible? 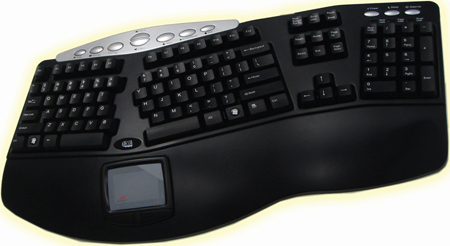 Answer: The Adesso PCK-308PB PS/2 Contoured Ergonomic Keyboard with TouchPad is not compatible with Apple. But here's a Goldtouch keyboard that is compatible with Apple products.